'Greatest Game Ever Played' Disney movie review. 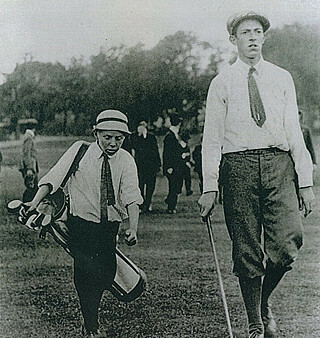 More about the story behind the movie of the 1913 U.S. Open and victory at Brookline by former caddy Francis Ouimet! Welcome to CaddyBytes.com review of the movie 'The Greatest Game Ever Played' a Walt Disney films release due out in theatres around the U.S. Sept. 29, 2005! Bill Paxton directs the Mark Frost made for Hollywood story and stars actor Shia LaBoeuf as Francis Ouimet, Stephen Dillane as Harry Vardon, and Josh Flitter as Eddie Lowery. The movie is about the true story of how Francis Ouimet (a former caddy) defeated the great Harry Vardon and Ted Ray in the U.S. Open of 1913 held at The Country Club in Brookline, MA. Click on the picture above to read the story about Ouimet's great feat and in the left hand column as well as links to stills of the movie!